By means of internal jumpers one can select which parameters are controlled by the CVT input (e.g. D only or D+R or A+D+R) and in which direction (i.e. if an increasing CVT shortens or stretches the time parameter in question). By means of another jumpers output 2 can be set to normal or inverted envelope). access to the gate signal of the bus for each ADSR. A-142-3 Envelope Controlled VCA Module A-142-3 is the combination of a simple AD/AR envelope generator and a VCA behind a front panel with 4HP only. The type of envelope can be selected by means of a toggle switch between A/D (Attack-Decay) and A/R (Attack/Release). Another toggle switch is used to choose envelope or (free running) LFO mode. The envelope output controls a linear VCA. Furthermore, the modules that were already announced at Superbooth 2017 like the A-138s Mini Stereo Mixer and A-150-8 Octal Voltage Controlled Switch will be available pretty soon now... and the A-180-9 got a final facelift and got upgraded from 12 to 14 channels through standard network cables. 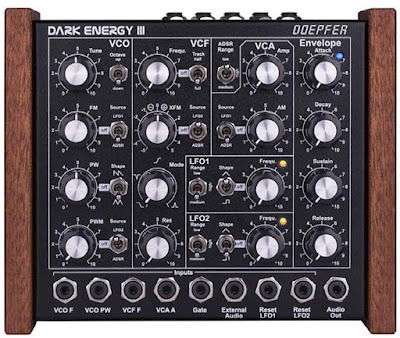 Right in time for the upcoming NAMM exhibition later this week (January 25/28 2018, Anaheim, Hall A, booth 10706), Doepfer announced a few more interesting A-100 modules (next to the Dark Energy III news). Too many new modules for one blogpost, so I had to split it up into multiple blogposts... The next one will contain their new 'standard' modules. The magic word for Doepfer this year seems to be Polyphony, because most of the new products are perfect companions for the highly anticipated A-190-5 Polyphonic CV/Gate Interface, a module that has been in pre-production for a loooong while now. On the Doepfer website we can still read the message We cannot yet specify a definite release date but hope that it will be available in 2011, from the early prototype stages. A-190-5 is a Midi/USB interface that generates 4 gate signals and 12 control voltages to control up to four synthesizer voices (i.e. VCOs and associated modules like envelope generators, VCFs and VCAs) for polyphonic sound generation. The A-190-5 will be equipped with different polyphonic, duophonic, paraphonic and monophonic modes which are selected by means of menu buttons and the display. For each channel a gate, a note controlled CV (1V/Oct.) and two auxiliary CVs (e.g. for velocity or controlled by midi control change messages) are available. In play mode the states of the four gates are displayed by four LEDs integrated into the buttons 1-4. Firmware updates are possible via USB. Brandnew is the A-105-4 Quad SSM VCF filtermodule, their first polyphonic filter and contains four identical 24dB Lowpass filters (SSM2044 type). The special feature of the 4 pole low pass SSM2044 is the patented so-called "true open loop design that delivers a characteristic fat sound not available from other devices"
This chip was used e.g. in these synths: Korg Polysix, Korg Mono/Poly, Fairlight II, PPG Wave 2.2 und 2.3, Emu SP-1200, Siel KIWI, DK600, Siel Opera 6, and the Simmons SDS5. The first Prophets 5s used the SSM2040 - the precedessor of the 2044 - that generates a very similar sound. (source) Version 3 of the Prophet 5 switched to the thinner sounding Curtis CEM3320. The Pro One also used that chip. generator (e.g. A-141-4). The envelope amount for all four filters is controlled by the FM knob and the CVFM input by means of four built-in VCAs, which are controlled by the FM control and CVFM input. This allows also voltage control of the envelope amounts. In addition common frequency modulation for all filters is possible (e.g. by an LFO). For this the CVF input with attenuator can be used. The range of the audio input level control (L) allows also clipping/distortion with typical A-100 audio levels (e.g. from A-111-4) at the filter inputs. Even this parameter is voltage controllable as well as the resonance (Q). The A-132-8 contains four VCA pairs. Each pair includes two daisy-chained VCAs. One VCA has a linear control scale, for the second VCA linear or exponential control scale can be chosen by means of jumpers. 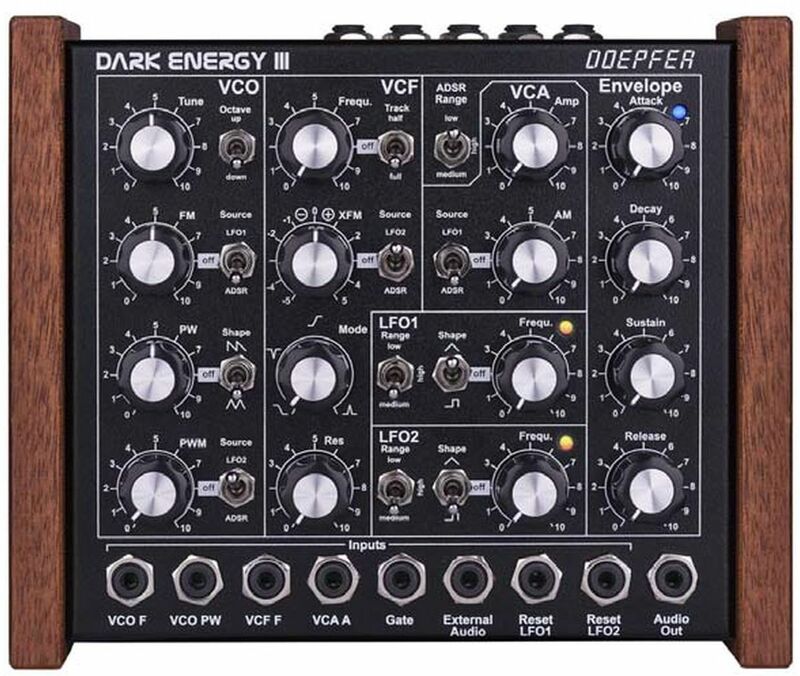 Doepfer decided to provide two VCAs for each voice because usually one VCA is required for loudness envelope and a second one for velocity (or another function). Audio Sum Output is also available. The module features two Initial Gain controls, that enable the opening of the first (G1) and/or second VCA (G2). This is necessary when the VCA in question is not in use (i.e. no external CV available). Otherwise the VCA would close. They are also useful for testing polyphonic patches. Application: Polyphonic patches with two VCAs per voice. The A-141-4 Quad Poly VCADSR contains four ADSR type voltage controlled envelope generators with common manual controls and CV inputs with polarizers for the parameters Attack (A), Decay (D), Sustain (S) and Release (R). Each of the four envelope generators has available a gate input, a control LED and an envelope output. I've been a long-time fan of Mylar Melodies. 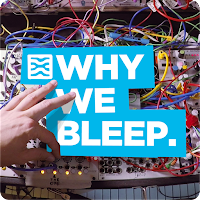 and his (Eurorack) video-productions, and yesterday he released the first episode of a brand new monthly podcast interview-series. 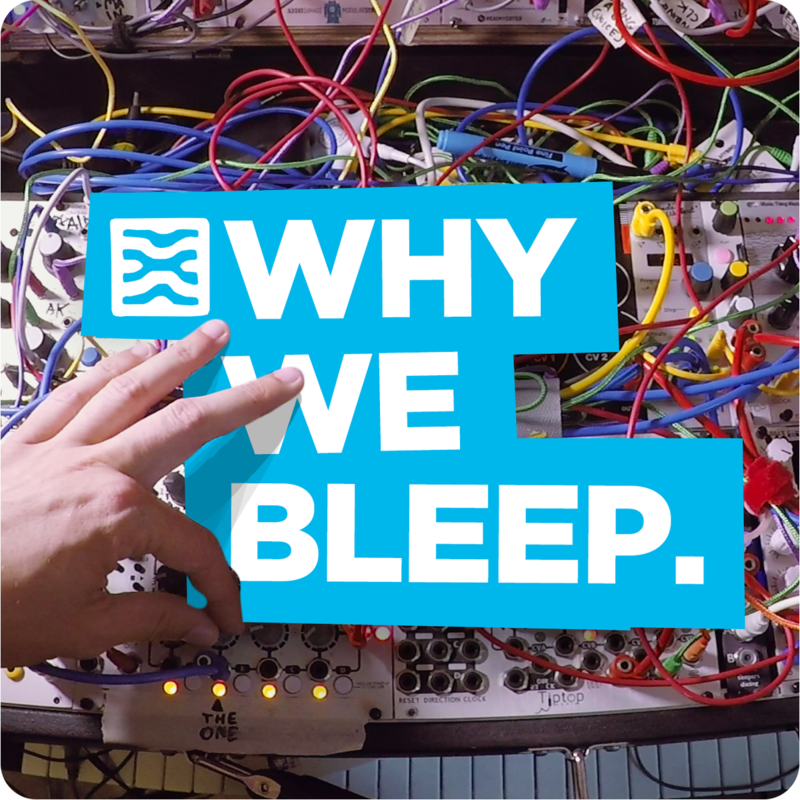 The new show is called Why We Bleep, and in it he meets electronic music makers and the people who make their equipment. He explores their experiences, their processes, and see what can we learn from them. "The show is inspired by an eternal struggle to get better at making music. To better understand the mysterious, unique and amazing people behind the equipment and music that we love. And to better understand where music making might be going. ", according to the creator. The podcast is available on iTunes, YouTube, and HERE on his site, and takes the form of a conversation recorded in-person, and also captured on camera where possible. Next episode will be Justin Owen of Abstract Data, Abstract Data designs & manufactures electronic musical instruments & effects in Eurorack Modular and Desktop formats. Doepfer announced some interesting new stuff for the upcoming NAMM exhibition later this week. improved VCO (no warm-up period, additional triangle waveform, wider frequency range), resettable LFOs, improved ADSR and a lot of internal access points for DIYers. The filter of the Dark Energy II has been unchanged. The sound generation and all modulation sources are still 100% analog, only the USB/Midi interface contains digital components.